The finance industry is undergoing one of the most substantial transformation shifts, driven by the rise of AI-driven applications. 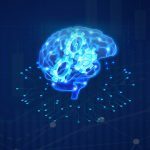 Artificial intelligence is broadening the scope of powerful computing solutions and making the impact of faster analytical insights on overall business strategy. AI in customer service, hedge funds and sales & financial products is driving a revolution with its newfound capabilities – rapidly pushing conventional computing architectures to their limits. Let us analyze how rising adaptability to AI-driven finance solutions is one of the cornerstones of making the finance industry more agile and in line with the demand of consumers. Another arena of increasing demand in the finance business is customer-service that is available 24/7, with efficient recommendations. Financial institutions have, over decades, had a separate department that is dedicated to customer service via human involvement. However, as will all other aspects, this segment of financial services is in need of digitization. Non-Personalized Service Approach: Customer service that is undertaken via human interaction is generally one that is sporadic. 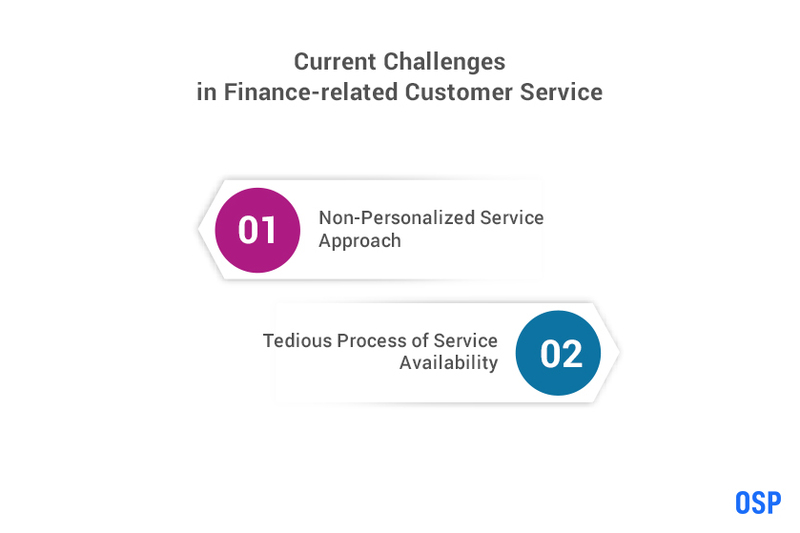 When a customer calls in for a service request, the finance representative sporadically pulls up the customer information and offers a generic solution. Tedious Process of Service Availability: The traditional methods of customer service are proving inadequate due to the length of time and effort it takes the customer to reach a human service representative. Customers are now looking at quick availability and error-free service. Personalized Recommendations: AI now provides the institution with the ability to provide customized communication to each customer through the record and analysis of their individual data. This will include recommendations and advice for improvisation. This includes tracking of spending and automated recommendations for saving. Real-time Advice: AI technologies are now empowered to provide real-time advice that is updated with the most current information of the customer and error-free. Further, AI is now able to provide customers with a financial personal assistant, much like ‘SIRI’ that is able to offer advice, information and recommendations at the click of a button. As the finance industry is being revolutionized, sales personnel and traders are being replaced with AI technology that can undertake the job faster and better. Machine Learning, Robo-advisors and Intelligent Analyzers are taking over the sales domain of finance and there is no turning back. Non-predictive Human Decision Making:Marketing and sales representatives have traditionally adopted an approach wherein they would promote products that were personally beneficial to sell, or make recommendations based on relative skill. Predictions were generic in nature and not confounded on analysis. Human Involvement for Manual Processing:Every aspect of sales that is managed by human sales representatives requires manual set up of meetings, calls, etc. The time and effort involved in this process can sometimes cause delays and turn inconvenient for end customers. Common Workloads Increase Sales Dissatisfaction: The traditional model requires sales representatives to handle basic paperwork, updates and tasks that create dissatisfaction over their mundane nature. 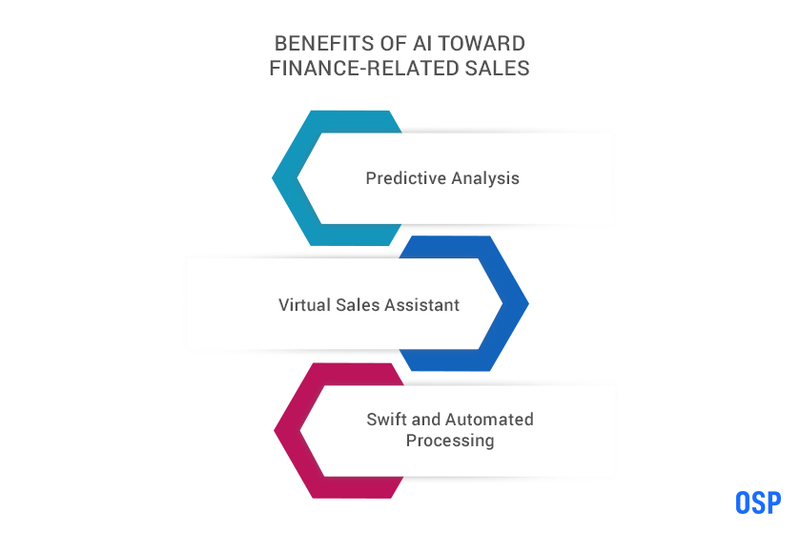 Predictive Analysis: When it comes to sales, AI has the ability to use data, establish patters, make sound predictions that are relative to every financial product and thereafter, apply math and data to make a reliable recommendation. Virtual Sales Assistant: AI technologies now offer a virtual sales assistant that can set up sales-related meetings, make sound estimations and predictions, offer real-time updates, and provide 24/7 availability for the convenience of the customer. 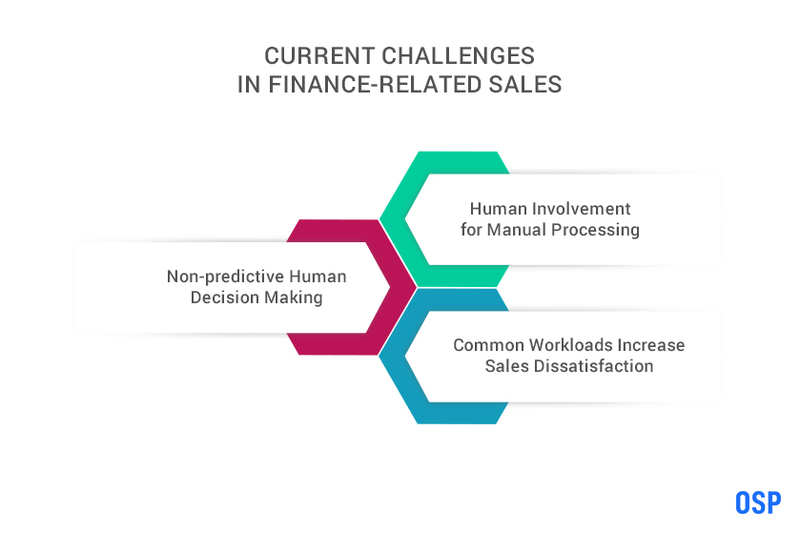 Swift and Automated Processing:All repetitive procedures, updates and basic workloads are undertaken in an automated fashion and human sales representatives are allowed the luxury of focusing on the core components of finance-related sales. We are at a point in digital innovation where we now have hedge funds that are artificially intelligent. This means that all stock trading takes place in an automated fashion, with no human interaction involved in the process. 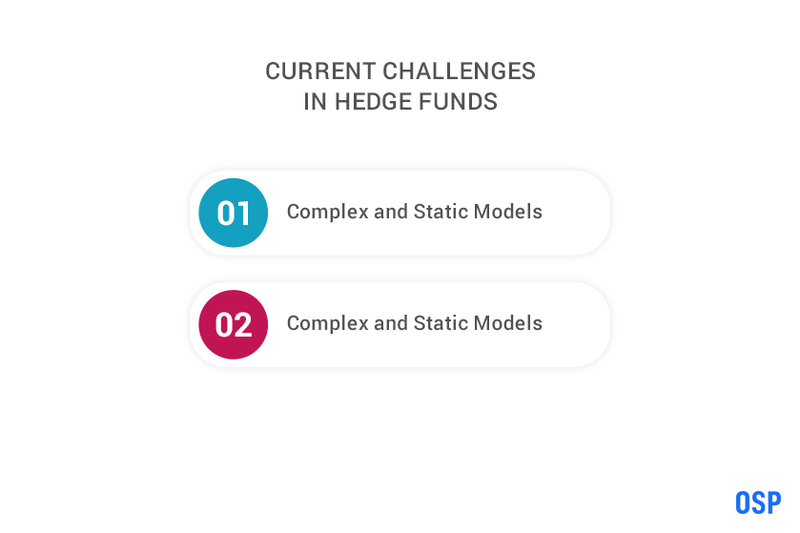 Complex and Static Models: Hedge fund managers have always relied on computer models to make their analysis and predictions. However, these traditional models are heavily laden with large amounts of statistical information and are proving to be inadequate with changing times. Lack of Skill and Historical Reference: Every hedge fund manager is restricted in terms of their own level of skill and their exposure to historic patterns and trends for holistic understanding. This affects their overall performance. 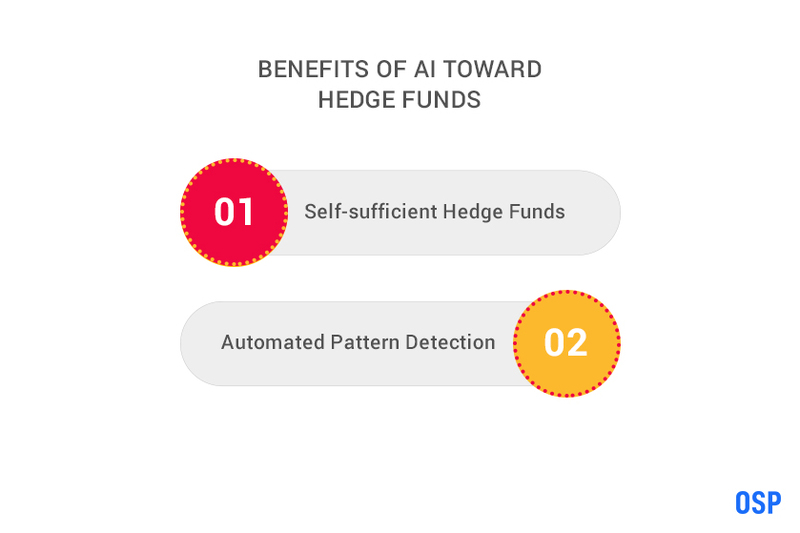 Self-sufficient Hedge Funds: These are automated hedge funds that undertake trades independently, through multiple artificial intelligence features. This is done via intelligent analysis of market conditions and data to make predictions and take action. Automated Pattern Detection: Through innovative technologies, AI-empowered hedge funds can now use heaps of historical data and references for pattern detection and recommendations. These automated systems can then undertake sound trading with a holistic purview. Artificial Intelligence is a technology revolution in itself, with the capability to completely transform the finance industry as we know it. At regular intervals, we are exposed to technologies that are able to perform tasks, previously considered impossible. Economic growth rates can be substantially increased through the adoption of these technologies. Natural language processing increases the quality of interactions between customers and computers and Machine Learning works with volumes of data to make meaningful patterns and recommendations. These technologies are used to create digital customer agents, algorithms and data analysis. Operations and outcomes are poised to reach new levels of quality improvements. We are now at a point where financial institutions are not only aware of the potential of AI, but also embracing its benefits. Financial institutions are making big investments towards these technologies for streamlining operations and attracting customers with high-end improvised fundamental financial processes.